The film started as just an adolescent way of showing off. I had no intention of making the film - what I wanted to do was to capture the imagination of producers. When THE SEATTLE WORLD FAIR opened last summer the "hit of the show" was the Spacearium featuring a new space motion picture system created and constructed by Cinerama for the Boeing Co. and the United States Science Exhibit. So, what about the Sound of Music on Blu-Ray? I thought the holy rule for preservation and restoration was not to make it “better” than it actually was to begin with? Who knows what "better" is in fifty years? In the Himalayas, is the Indus River, noted for its strong and swirling currents. In the middle of these rapids, last July 20, a boat containing eight men and a three-eyed Cinerama camera suddenly capsized. From coast to coast Cinerama has been the talk of the year. So far it has been presented in only three cities; New York, Detroit and Hollywood—with perhaps Chicago and one or two others by the time this appears in print. eye filling curved picture from three projectors and ear filling sound from multiple speakers made Cinerama seem real. Rollercoaster in this scale model gives the audience a hair-razing ride. I'm going to tell a more or less chronological story of the entire development of the Cinerama process. It's not a short story but I'll try to keep it condensed. Vertigo looked amazing, a mint condition print! The Vista Vision negative really showed through on 70mm and the sound was great "The Story of the Schauburg"
On behalf of the Schauburg Cinerama Theatre it is my pleasure to welcome you to the 6. Todd-AO 70mm film festival to join us for our nostalgia trip in the splendor of Todd-AO! I love the smell of mag in the morning! Seeing all those reels of 70mm film at the Lost Dominion 70mm Film Festival made me think I’d died and gone to heaven! O’ death where is thy sting? Once again delegates from all over the world came together to view films at the Pictureville Cinema and focus on the contribution that widescreen filming and presentation has made to cinema culture. Starting in October 2010, Astor Film Lounge, will show a series of 70mm film classics under the title "Film Classics at the Astor Film Lounge" Remember "The Alamo"
I was invited to attend a screening of "The Alamo" at the Carthay Circle - one of those magnificent old movie houses from the glory days of Hollywood - vast and luxurious. Some ruminations after "The Reel Thing XXV"
Trumbull showed us a tantalisingly brief excerpt of his new "2001" documentary and revealed that Warner was preparing a final cut of "2001"
Before the shoot I ran a few feet through the camera to check the overlap points between panels and the consistency of exposure across the three 35MM matching lenses. The biggest movie in the world will now be shown in one of the world’s smaller theatres: The Biffen, at Nordkraft (North Power) in Aalborg. The summer of 1984 was a memorable one not just for movies in general but for fans of the 70mm presentation format. The film was shown on a reserved-performance, guaranteed-seat basis and presented in 70-millimeter and Six-Track Dolby Stereo, which showcased a then-new quintaphonic split-surround audio mix. “Breath-taking Todd-AO” debuted in Ireland on 26th December 1958 at the Adelphi Cinema, Dublin with "South Pacific" and "The Miracle of Todd-AO". At the time the cinema was one of the biggest in the city, with over 2000 seats. The film "Operation Taifun" was the beginning of a new 3D filming and reproduction process with the name Hi-Fi Stereo 70 in Europe. The Greatest film format of all time lying just next to the Greatest comrade of all time. For the large format fans, Tom March has written a very fine "How the West Was Won" location-hunt report for Cinema Retro's 17th edition. There are more things in life than just widescreen! ‘Blow-ups’ became popular as a sort of Claytons 70mm: the 70mm you have when you are not having 70mm. The recording's release anticipates by about five months the 50th anniversary of the premiere of the film itself on October 24, 1960 at the Woodlawn Theatre in San Antonio, Texas. 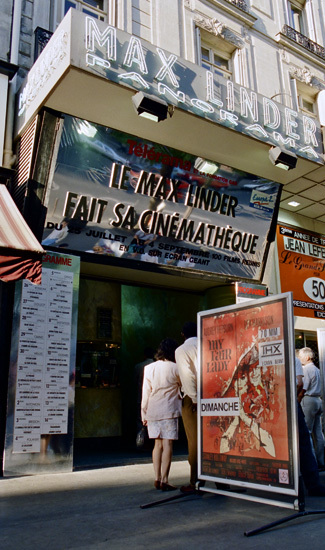 Cinerama, Ultra Panavision 70, CineMiracle, Super Panavision 70, Todd-AO, Gonflage 70mm, Sovscope 70, VistaVision, MCS-70… des noms barbares aux oreilles et aux yeux des spectateurs les plus récents. Remember real 70mm? S/S Christian Radich is a heaven for fans of polished brass. Join in70mm.com on a tour to the finest ship of its kind. Since the opening of "This is Cinerama" in the Broadway Theatre, there has been a lot of discussion about whether the sound is too loud. Roadshow Engagements of "It's A Mad Mad Mad Mad World"
I recently found some old photos I had taken from the projection booth of a theatre I was managing in 1978. Sunday night the International Cinerama Society will put on a program about the history of Cinerama. It should be a grand time. We went to the next best thing which was 65mm. So we have the highest quality image of any film that’s being made. Housed in the historic former Lambeth Workhouse, where Charlie Chaplin had spent a traumatic childhood, the Museum boasts one of the most impressive collections of cinema memorabilia in the world. Karl Malkames, a cinematographer, inventor, film historian and pioneering motion picture film preservationist, died March 8th at his home in Scarsdale, N.Y. He was 83 years old. The Kino Mir 70 theatre will again be the meeting point for 70mm film enthusiasts from many European counties. 5th 70mm film festival in Krnov: say KRRR! wide and aloud! Disney's Heather Rivera says Disneyland will show a 70mm print of the 17-minute movie in the Tomorrowland theater. I have constantly been asked by widescreen enthusiasts whether my 70mm t-shirt would be available for sale. 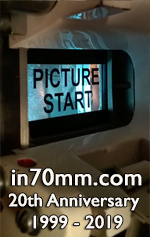 I have decided to give it a try, and will offer a limited special edition of the „70mm“ t-shirt. To supplement 70mm screenings in Los Angeles in April 2008, I thought it might be appropriate to chronicle a brief history of widescreen and wide-film highlights from the birth of cinema to the present day. Es muss fast 30 Jahre her sein, dass ich "ERDBEBEN" (OT: "EARTHQUAKE") zum ersten Mal gesehen habe, als der Film hier in Deutschland in die Kinos kam. "ERDBEBEN" hat mich sehr beeindruckt. Am 6.+7.Juni 2009 fand das 2.Widescreen-Festival in Karlsruhe in der Schauburg statt. Dieses Mal war das Motto „VistaVision, Technicolor und Perspecta Sound“. I was Invited to Milan by Mrs. Luisa Comencini, Fondazione Cineteca Italiana, for the festival „70mm - Bigger than Life” to supplement that project with several 70mm prints and suggestions. Antique Camera in Paris, France are selling a vintage MCS 65mm camera. Something for the readers of in70mm.com? Last night at a special program at UCLA's Bridges Theater devoted to unusual film picture and sound formats, two examples of 65mm origination and 70mm presentation were shown. Spain & "Jesus Christ Superstar"
Fred Waller's 1950 desk calendar. A fascinating account about who is visiting Cinerama and Vitarama. Schauburg Kino, Karlsruhe October 2009. 70mm films presented in all their screen splendour. The London Casino Theatre was selected, after an exhaustive survey, as the best available in London for the showing of Cinerama. Nevertheless, considerable difficulties had to be overcome to make it entirely suitable for the purpose. Matchline elimination begins in the camera and continues through the film handling process to the final projection. In the camera, four possible sources of trouble exist. These are edge vignetting, or masking, edge reflection, scratching and pressure exposure. D. W. Griffith wanted a cyclone to destroy a distant Village, sweep clean a country side leaving destruction in its make and at a cross road destroy a particular Inn in a particular way. I was asked to make a cyclon and film it and quick too.